I’ve always enjoyed Nairn’s Oatcakes, especially with some soft cheese on top, but I’d never tried their range of Oat Biscuits. So I was delighted to have the chance to try and review their biscuits which come in four varieties – Stem Ginger, Dark Chocolate Chip, Fruit and Spice and Mixed Berries. The wholegrain oats in Nairn’s biscuits slowly release energy making them a naturally energising, healthier option for the whole family. Because they release energy slowly, they are ideal for diabetics like me as they don’t result in dangerous peaks and lows of sugar levels. Nibble at leisure with your favourite cuppa or pop some in your bag to see how wholegrain oats really can help you can get the most out of your day. 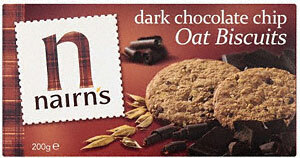 Nairn’s oat biscuits are made with wholegrain oats to a wheat free recipe. They are high in fibre and contain no hydrogenated fat, GM ingredients, artificial colourings, flavourings or preservatives. 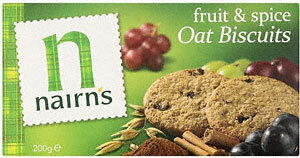 I first tried the fruit and spice oat biscuits, which turned out to be my favourite of the four flavours available. They are a perfect mix of juicy currants and fragrant spices. 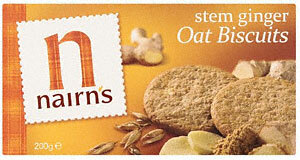 Nairn’s have used a blend of cinnamon, nutmeg and ginger make these oaty biscuits wonderfully aromatic. They are really yummy, the spices are not over-powering, but just enough to give these biscuits an edge. 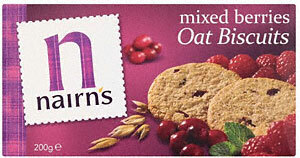 The Nairn’s Mixed Berries oat biscuits are full of dried cranberries and flavoured with raspberry. These fruity biscuits are Great Taste Award Winners and they’re literally bursting with flavour. I loved these too; they went perfectly with a cup of tea – great dunking biscuits! The Dark Chocolate Chip biscuits are really chocolaty and indulgent. But they are still a guilt-free treat as they contain no hydrogenated fats and are only 44 calories per biscuit. These were Sarah’s favourites, she loved nibbling them with her cup of coffee. The Stem Ginger biscuits are the only ones I didn’t try as I don’t like ginger, but the rest of the family loved them. Dad was a big fan; he thought the strength of the ginger was just right. The Oat Biscuits by their nature are a little drier than some other biscuits, but I loved the texture of them and they are perfect to have with your morning cuppa.